Everybody knows that soul-filled Daryl Hall and John Oates are Philly-bred, just like the titular sandwich behind their live music-and-food festival, HoagieNation. 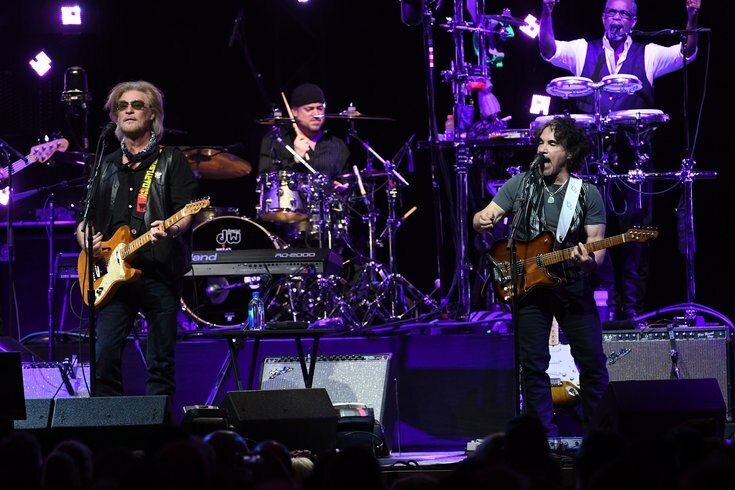 For the event's second iteration at Festival Pier – this Saturday, starting at 3 p.m. – Hall & Oates are joined by Train (their touring mates for the entirety of a spring/summer tour), Fitz & The Tantrums, and Philly's own Tommy Conwell and the Young Rumblers. A recent addition to the HoagieNation bill is Nashville music giant and country-rockabilly legend Marty Stuart & His Fabulous Superlatives, "an absolute must-see," said Oates, regarding Stuart's lyrical and instrumental prowess. For a moment, though, let's focus on one of the most exciting aspects of the show, and of Hall & Oates, period. For the first time in more than 15 years, Hall & Oates have a new single to crow about, "Philly Forget Me Not." The soulful, new track marks the first time Daryl and John have released a new song as H&O in 15+ years, (since “Do It For Love” in 2002), and the new tune was penned by Hall and Train's frontman, Pat Monahan, and features Train on the track. Like the classic 1972 song, "Fall in Philadelphia," "Philly Forget Me Not," is an ode to all things local and loving. So, what does it take to write a "Philadelphia song?" Ask Hall. "It's all about being real," said the Pottstown-born Hall, who first met Oates downtown at Temple University in 1967. "I have devoted my creative life to this, and there is no place that I know that is more 'real' than Philadelphia. [The key to writing this is] just let out your feelings and you can't go wrong. That's soul. That's Philly." The locally-born Oates made mention of "Philly Forget Me Not," by adding that the duo had not intended on recording this tune. Both record as solo artists and tour as Hall & Oates, an arrangement of which both seem satisfied. "'Philly Forget Me Not,' came about in a natural way, as Pat Monahan brought the idea to us of doing something cool to promote our tour," said Oates. "Philly – that thing – is in us. A song with Philly has to have a groove, has to connect on a certain soulful level. Look, there's something inherently Philly in all that Daryl and I do. Once it's in your blood, you can't get rid of it." Along with touring constantly as H&O, there is a shifting gears process, for both men work solo – Hall on his television program "Live from Daryl's House," and Oates on recent folk-country excursions, such as his recently-released "Arkansas" album, of which he's toured. Getting together with Daryl is easy, and right now, I'm in full Hall & Oates mode." Is it a big deal to go from one to the other? "The musical transition is never a big deal," said Oates. "The real adjustment comes from playing intimate halls with my band to concert arenas and huge outdoor spots like Festival Pier with Daryl. Our volume and style is just bigger and louder. It's just the nuts and bolts stuff that's weird. Getting together with Daryl is easy, and right now, I'm in full Hall & Oates mode." Right now, being in full Hall & Oates mode means HoagieNation, a party that started in 2017 and shows no sign of slowing. And while Hall once told this very writer that he still eats the local delicacy of "Lebanon bologna" daily, even though he lives in Connecticut, you had to wonder if Oates will be pigging out during HoagieNation. "As I have gotten older, I have to try to avoid the heavier foods, but, I just saw the menu for the fest, and the newer hoagies look and sound so damn good, I may have to do a tasting," he said. "Maybe I can take a bite of each one there and get some wrapped to take home with me to Nashville." Yo, John. It's your HoagieNation. You can take home whatever you want. All information, time, prices, and VIP packages for Saturday, May 26's HoagieNation and Friday May 25's pre-party and culinary celebration at the Fillmore Philly with Mayer Hawthorne, In the Pocket and some of this city's finest chefs can be found here.